Nothing is perfect. We admit to a few flaws with Darbee’s latest image enhancer, the Cobalt. Nothing earth-shattering, but you should probably know about them before you buy. 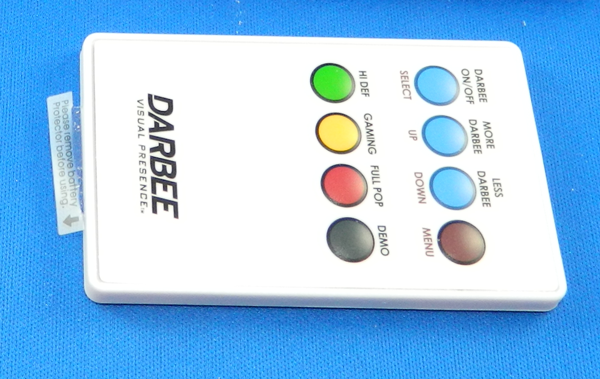 The Darbee remote is nothing to write home about. It’s the size of a credit card and works about as well as one. The buttons take a lot of effort and they aren’t arranged in a terribly sensible way. It’s IR-only and won’t work with an RF transceiver like our NextGen Remote Extenders because it uses a coin-type battery. You could program a universal remote to use these codes if you have one that can learn from another remote, and that’s what we would recommend if you plan on making a lot of changes. As you can see in the picture above, the on-screen display is set to always show by default. This will make you happy for the first few hours as you play with the box but eventually you will want to turn it off. Use the MENU button on the remote to change that setting as soon as you have the Cobalt dialed in. Like the Darblet, the Cobalt has tons of fancy lights, one of which flashes, to tell you what’s going on. They are set back behind the semi-transparent plastic so the traditional method of using black electrical tape to cover them doesn’t do a whole lot. The good news here is that you can use the menu to dim the lights or turn them off. Remember because of the IR-only remote you do need to be able to see the Cobalt to control it. The only issue that really can’t be addressed quickly is the lack of persistent memory. Unplugging the Cobalt will cause it to lose some of its settings and you will have to reset the levels of “darbee” again. It’s the same thing if there is a power failure. It’s not the biggest thing in the world but it can be a little annoying. Overall though, we would rate the Cobalt a “buy” for anyone who wants an easy image enhancer that doesn’t take up a lot of space and works very well for non-3D source material without causing problems for 3D source material.